Niki Terpstra won the prestigious Paris-Roubaix one-day race as British duo Geraint Thomas and Bradley Wiggins finished in a group 20 seconds adrift. 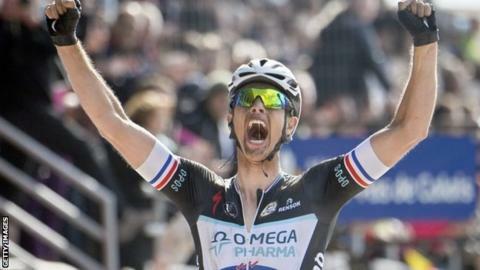 Dutchman Terpstra broke clear in the last 10km of the 257km race in northern France, which finishes in a velodrome. Thomas and Wiggins were seventh and ninth respectively after John Degenkolb and three-time winner Fabian Cancellara won the sprint for second and third. "There's a tinge of disappointment because I had the legs," said Wiggins. "It gives confidence that I can match those guys and to go top 10 in hindsight is a good result. "I'd love to come back in the next few years and do it again." Thomas admitted he was "on his knees" in the final 10km after helping Wiggins close down a gap to the leaders in the closing stages. "The way I rode it wasn't the easy way," he told Team Sky's website. "We were out front for a lot of the time. It's satisfying, but at the same time we wanted to get a podium." Terpstra, a 29-year-old rider for the Omega Pharma - Quick-Step team, who finished third in last year's edition of the Spring Classic and fifth in 2012, was a popular winner. "It's the best day of my career. To win the biggest Classic of all is a dream come true," he said after becoming the first Dutch rider since 2001 to win a race more affectionately known as the Hell of the North. "Since I was a little child and I started cycling, Paris-Roubaix was the most special race for me." Terpstra made his attack stick in the closing stages after several failed attempts by his rivals and team-mates. Tom Boonen, who was chasing a record fifth victory in the race, was the first to break clear of the main contenders on one of the 28 cobbled sections, 64km from the finish. Slovakia's Peter Sagan and Belgian Sep Vanmarcke tried separate counter-attacks, while Team Sky duo Thomas and Wiggins worked hard to join a lead group that also contained Terpstra, defending champion Cancellara, Degenkolb and Zdenek Stybar. Degenkolb, as the best sprinter in the lead group, became the favourite but while everyone else was watching each other, Terpstra broke clear and quickly established a lead of 15 seconds as nobody had the legs to go with him. He entered the open-air Roubaix velodrome on his own but sprinted the lap and a half to the finish before watching Degenkolb edge Cancellara in the race for second. 1. Niki Terpstra (Ned/Omega Pharma - Quick-Step) 6:09:01"
2. John Degenkolb (Ger/Giant) +20"